Welcome to today's meeting of the Council for Traditional Stone Age Marriage and Family. My name is Reverend BillyBob WillyRob. Our organization has proudly supported and protected the sanctity of marriage and the family according to the laws of the Lord God ever since He simultaneously created the Universe, the Earth, all of humanity, the dinosaurs, and most Walmarts some 16 and a half years ago. Boy, time sure flies when there hasn't hardly been any of it! Brothers and sisters, we know and revere God's Plan for Marriage! He hath ordained it within the Holy Scriptures at Genesis Section 69:69, which in case you missed it came out last Thursday to mostly good reviews, at least so far. "Marriage is a holy union between and unto one man and one woman exclusively, only, forever, and you betcha! And such man and woman shall cleave unto one another until such time as I blow a whistle to end the cleaving. Any other union is hateful unto Mine Eyes! Although frankly Mine Eyes might take a quick peek if such union involve two women, one of whom is a redhead named Trixie." But now, brothers and sisters, there has comes a threat to God's Holy Plan! There have arisen two men of the same gender, personal apparatus, and brand of deodorant who wish to marry each other rather than to marry someone who douches! 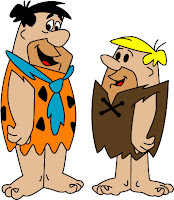 Their names, brothers and sisters, are Fred Flintstone and Barney Rubble! You'll have a gay old time." What does it all mean, brothers and sisters? It means two dudes! Or two chicks! Not a dude and a chick, as in compliance with the Lord's immutable, unbending, and eternal will .... as laid down in Genesis late last Thursday. Has nothing to do with how Mr Flintstone operates his non-motor vehicle. Rather it's very likely the major reason Mr. Rubble wishes to marry Mr. Flintstone. I need say nothing more. These are obviously the very words that are shouted out loud at the exact moment of climactic excitation during sexual relations between two persons bearing the same manner and degree of facial hair --- that is, two men, two women, or two older women living in what will one day be France or Italy. 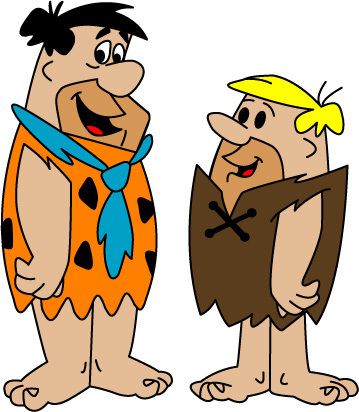 "A Yabba Dabba Do Time, a Dabba Doo Time, a Gay Old Time"
What Mr.Flintstone and Mr. Rubble wish to share for the rest of their lives. They must expect it to be carefree and happy, thus the use of the word "gay." Brothers and sisters, what people like Mr. Flintstone and Mr. Rubble seek is a true abomination of nature: to marry persons of the same gender whom they love rather than marrying the nearest loser of the opposite gender out of desperation, as all the rest of us do! And so, we must fight the battle for the Traditional Stone Age Family for as long as it takes to win --- should it take 5,000 years! Which would bring us up to about the year 2012, give or take a decade or two, carry the one.